Root Rot: Prevent it Now! Root Rot is a generic name for several common opportunistic waterborne diseases that can seriously affect indoor and outdoor crops year round. Plain and simple, Root Rot (decomposition of the roots) is primarily caused by Anaerobic Conditions (lack of oxygen) in the root zone. We know from experience that Root Rot is often lethal. And, treating Root Rot is more difficult than preventing it. Keep your system clean. Disinfect all surfaces, potting benches, tools, and equipment that will come in contact with your growing system. Periodically, thoroughly clean and disinfect ebb and flow reservoirs, benches, and flood and drain floors. Lack of oxygen at the root zone is the leading cause of root death and decomposition. Decomposing organic material in the nutrient solution or trays can also cause lack of oxygen. This material should always be removed. Another problem could be too many plants competing for too little oxygen. High root zone temperatures can also worsen these problems. (See Goldilocks and Your Root Zone). A healthy root zone is a continuously growing one. As long as there are new roots developing, some root death should not be a concern. The natural death of older roots and the production of new ones should be expected. A young plant root system should have lots of bright white furry root tips. 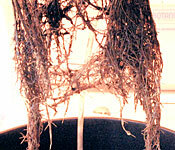 A healthy mature root system will be strong and fibrous and have a thick root mat. If the roots are cream or yellow colored on top of the mat, they should still have many bright white root tips underneath at the bottom. Thick, fat, white furry roots indicative of healthy root growth and are what you ultimately want to see.